Chess Olympiad 2008 round 4 LIVE! Welcome to the day 4 live coverage of the 2008 Dresden Chess Olympiad. Here you will find minute by minute updates on the events in Dresden, underlining important games, bringing you fresh photos from the playing hall, explaining you the new Olympiad rules, sharing interviews, news, and many more details. Feel free to send us your questions and comments to our contact form. An exciting day expects us in Dresden. After 3 rounds there are 9 teams with full points in the open section. Among them are the favorites Russia, Armenia, and Ukraine, the solid Romania, the strongest ever Norway, the top 10 seeded Spain and England, the young India, and the hosts from Germany. These teams will face each other today in what can be called the first day of super derby matches. In the women section we witnessed the big surprise yesterday when the young India team led by Dronavalli and Schadev managed to hold the super team of Russia. That leaves them out of the team with full pints, but surely both are still favorites for the medals. With full points on board 1 will meet Hungary and Georgia. Also undefeated are Armenia – China and Serbia – Poland. Find all the pairings from the women section here. If you can tune the DD channels do not miss the Vishy Anand show today at (16:00 European time). More info at the Vijay Kumar Anand show update. Today we will witness several 2700+ club matches. 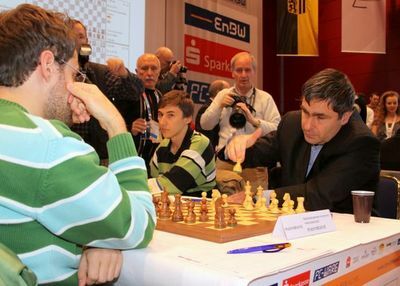 Vassily Ivanchuk will meet Levon Aronian on board 1. Ukraine and Armenia clash is a direct battle for a medal and the winner of this match can greatly increase the chances for top places. 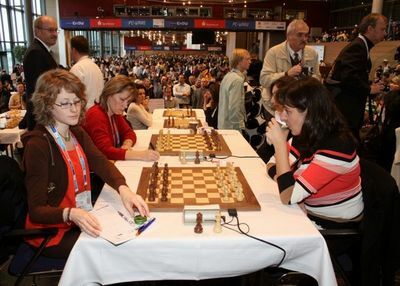 In the same situation are Carlsen and Adams in the Norway – England match and Kramik – Sasikiran in Russia – India. Azerbaijan and USA will also try to stay among the top teams where another 2700+ class will take place – Gata Kamsky vs Teimour Radjabov. Or in other words, a small copy of the World Women Chess Championship in Nalchik! One of the most interesting matches yesterday was the India – Russia 2-2 draw in the women section. It received high media attention in both countries, and for the first time optimistic feelings come from India. The Press Trust of India comments, “The Indian women slipped a bit in the standings after getting one point against the Russians but this result might go a long way in the overall standings of a depleted side without top player Koneru Humpy. Tania stole the thunder against Tatiana in a Nimzo Indian defence game. Capitalising on a tactical error, Tania won an exchange on the 28th move and wrapped the issue in 42 moves. Norway’s good victory over China also gets the deserved attention. AP writes, “Nineteenth-seed Norway upset 3rd-seed China in round three of the 38th Chess Olympiad on Saturday. In the most closely watched game of the day, 17-year-old Norwegian prodigy Magnus Carlsen — currently rated fourth in the world — played 21-year-old Wang Yue of China on board one. Wang had the advantage in the endgame, but Carlsen held the draw. The real hero for Norway was Kjetil Lie, who beat the much higher rated Bu Xiangzhi on board two. In other news, the good success of the Indonesian team against Kazakhstan is reflected in the Jakarta Post, “Indonesia’s women’s chess team battled to a 2-2 draw with favorites Kazakhstan with 14-year-old Dewi Citra playing the pivotal role in the second round of the Chess Olympiad in Dresden, Germany, on Friday. “Citra executed well the homework prepared by trainer Lasha Jangjagava,” team official Kristianus Liem said in a release. Jangjagava of Georgia was hired to prepare team Indonesian for the Olympiad, which features 154 men’s and 114 women’s teams from 152 countries. Citra, playing white, beat Guliskhan Nakhbayeva 2201 to 1802, despite having a lower world ranking than her opponent. Kazakhstan stole a point against Aigerim Rysbayeva and defeated Desi Rachmawati in a lengthy 74-move game. Jamaica news agencies are buzzing after mixed performance of their teams. “Against the stronger Ecuadorians, Jamaica played brilliantly to secure draws on boards 1, 3, and 4, but suffered a disappointing loss on Board 2 despite enjoying a clear advantage in the game. If you have media reports from your countries, feel free to send them to our contact form, we will make sure to cover as many countries as possible during our live reports. Half an hour is left to the start of the round. All top guns have been aligned by the teams and rating diffrences in most matches are much smaller than the previous days. Kramnik, Topalov, Carlsen, Ivanchuk, Adams, Shirov, Naiditsch, Nisipeanu, Leko, Kamsky, Radjabov, Van Wely, Caruana, Korchnoi, are ready to start in the open section. There will be a show as well in the women section with Harika, Hou Yifan, Maric, Zhukova, Cmilyte, Kosintseva, Muzychuk, Krush, etc. Stay tuned! Our good friend Warheart from the Karjakin blog has interesting coverage of the Olympiad. Here is what he writes yesterday. “Usually I obey to “no activity by Sergey = no post” but taking into account importance of this event I’ll write few lines. Captain of Ukrainian team decided to give Sergey necessary rest.Today Ukrainian team faced Georgia, Jobava vs Ivanchuk, Eljanov vs Izoria, Mchedlishvili vs Efimenko and Volokitin against Arutinian. The case about the mistaken score has also been covered in our live coverage of day 3. After many theories and research, the conclusion seems to be that the official site mixed up both broadcasts in the middle of the games and later on they started broadcasting only one of the games to the two boards, giving the final wrong score. 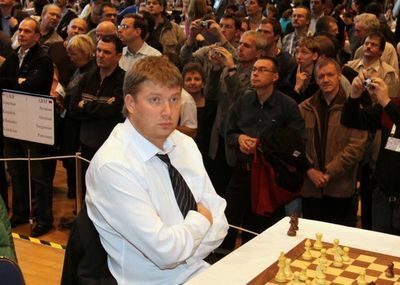 For a moment it was a celebration in both Georgia and Ukraine, but the team of Ivanchuk and Karjakin was the one to walk away with the victory. As M.Plattner just informed us, the notation of Volokitin game is changed and can be seen here. And the games have started! 1. e4 has been played in all games in Armenia – Ukraine. 1. d4 in all games in Russia – India. CM Savva Panikos wins a game for Cyprus, as his opponent does not show up. On the same basis Chung Sunghoon gets a point for South Korea. Carlsen and Adams have entered a well explored Queens Indian. On this match depends both teams medals ambition, so fighting chess is expected. Kramnik and Sasikiran are going for the Slav defence, a well known field for the Russian player. Nakamura and Mamedyarov have entered a very interesting and rare line of the Exchange Grunfeld. Istarescu choses a solid Petroff against Judith Polgar. Gundavaa uses against Topalov one of his favorite lines of the Sicilian Najdorf. Magnus Carlsen has a very good record against Michael Adams. This time the Norwegian prodigy has started well again and looks like he is going to have good chances in this game. On the lower boards 9 teams in the men section without a team victory – Honduras, Namibia, Fiji, Gabon, Papua New Guinea, US Virgin Islands, Seychelles, Rwanda, and Madagascar. Even though they do not have a won match, they have scored game points. In the women section only Pakistan and South Korea are without match points and they play each other today. WFM Ahmed Sthepanie scores for Argentinian women team in what looks like a straight forward match against the Seychelles. More was expected from the Argentinian women team until now and they have to catch up in the next round. GM Wesley So and GM Pappaioanou sign a quick draw on board 1 in Philippines – Greece. As there was no 3 moves repetition, either there was a mistake in the retransmission, or they have violated the 30 move no draw rule. Belarus open against Tajikistan. 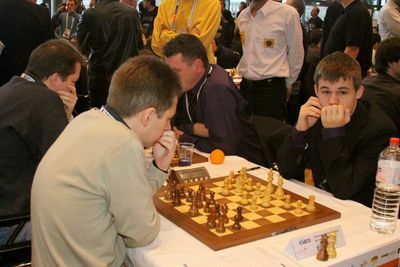 GM Azarov – Khuseinov 1:0. Namibia are also up against the Seychelles. The Romanian team chose very solid opening against Hungary and that will give problems to Polgar and company. Nisipeanu has material advantage against Leko, but it is not decisive yet and looks like Leko can hold a drawish position. Kotronias with a solid advantage against Jayson may give Greece a full point against the Philippines. Greece has been performing quite well until now, they have drawn the strong teams of France and the USA. Philippines also had a strong match against China, but could not win it. Topalov is calmly exploring a slight advantage and looking for ways to convert it into a victory. On the other boards Bulgaria looks solid and this match may be their retur for the fight in the top places. They will surely regret the first lost matches, but there are many more rounds to go. As we commented earlier, GM Nisipeanu had a pawn advantage against GM Leko, but there was no direct way to a victory. They agreed on a draw after 31 moves. It will all be decided on the lower boards. In another top encounter Sasikiran also looks stable against Kramnik. Malaysia and Slovakia sign a draw on board 2 after a 3 moves repetition. Good result for Lim Yee-Weng who managed to hold with black 200 ELO higher rated GM Jan Markos. GM Iordachescu and GM Steingrimsson sign a draw in Moldova – Iceland. No orange juice for Carlsen today? GM Efimenko – GM Sargissian draw! The Armenian player forces the draw after 35 moves. Slovenia take the lead against New Zeland after GM Lenic defeats IM Dive Russell. New Zeland have had two easy wins against Macau and Ethiopia, but looks difficult to achieve something important today. GM Mateusz Bartel wins logically against 600 ELO lower rate Robert Zerafa to give the lead to Poland against Malta. However, Octavio Croes (1980) has defeated GM Sveshnikov (2525) according to the official site. We will be checking this information for mistakes, as it seems quite unbelievable and will be the surprise of the day. In the women section Paehtz and Harika make a friendly draw in the Germany – India derby. They shook hands on move 24 after a 3 move repetition. WIM Joanna Majdan opened the score for Poland against Serbia with a victory over WGM Benderac. It seems Poland want to repeat their good performance from the European Team Chess Championship. Israel win their match against Bosna and Hercegovina with victories by IM Klinova, WGM Bella Igla, and WFM Marsel Efroimski. From what looked like a good position, GM Ivan Cheparinov is held to a draw by GM Hatanbaatar. Great result for the Mongolian player, while Cheparinov seems out of form. We are also checking the transmission of this game (still working on Sveshnikov as well) as there might be a mistake in the final result and moves. 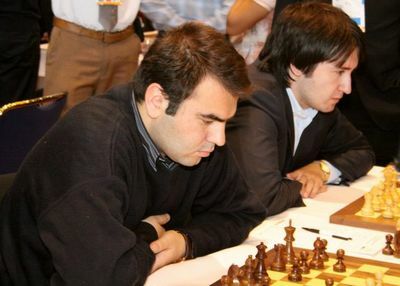 At the same time GM Dominguez Perez scores against GM Iturrizaga in the Cuba – Venezuela derby. Vietnam win against Japan, despite the good draw of Kojima against GM Nguyen Ngoc Truong Son. GM Fabiano Caruana wins against GM Korchnoi after imprecise play by the Swiss player. Leaving the king in the center made the game very difficult for him. The derby Russia – India is still going on. Sasikiran missed several good chances to get a win against Kramnik. He is still better, but he is very low on time. Svidler lost to Harikrishna, while Morozevich won against Sandipan. 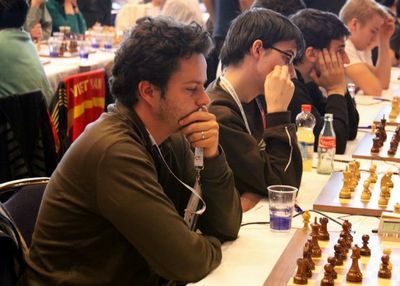 It all depends now on Grischuk – Ganguly. Sasikiran and Kramnik have just shook hands and it is a draw, India missed it there. GM Vachier-Lagrave gets a full point for France against the Dominican Republic. GM Kamsky could not hold his position and resigned against Radjabov. That is 1:0 for Azerbaijan and they are back on track. GM Topalov wins his game and GM Iotov finishies the match for Bulgaria. That is 4th consecutive victory for GM Iotov, currently the best player on board 4. China destroy Armenia in the women section! Cuba are also strong against Denmark. Grischuk will very soon close the game against Ganguly and that will be yet another victory for Russia. However, one more time it is not convincing and Kramnik had to struggle to draw with white. In the men section India could not win, however, they were convincing in the women one. The opposite happens with Germany and they stun Spain in the open section. Holland wins, but Van Wely loses on board 1. Carlsen saves Norway after David Howell put them up a point early in the match. Final score 2:2.